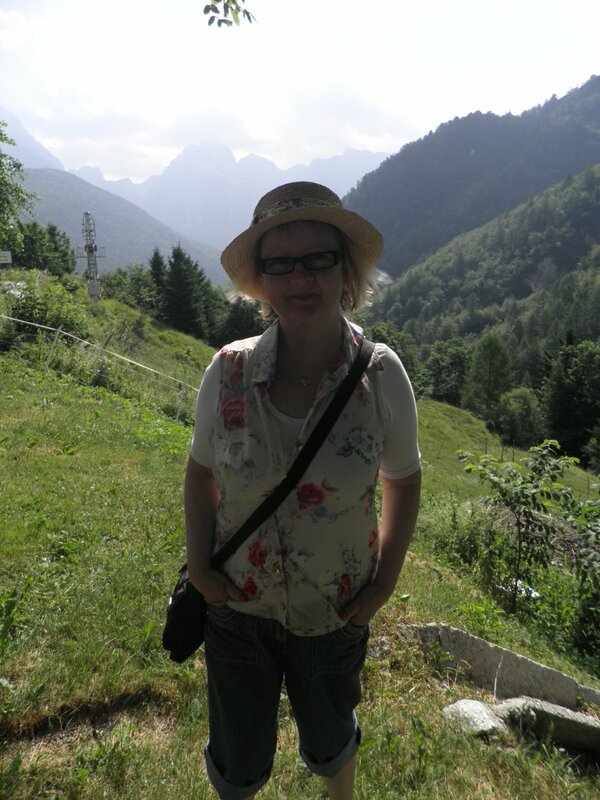 Poker Librarian: Back from Slovenia! Just an ordinary librarian in a lovely little village library who loves playing poker and longs to go to Las Vegas. Then one day she discovers a lump in her neck...this is the story of what happens next. 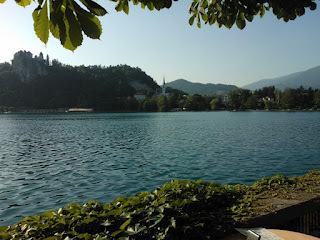 We are back from a wonderful trip to Slovenia - it is such a beautiful country and Bled is the most gorgeous little town situated round the edge of a stunning lake. Our holiday started when we went down to Stansted airport the night before our flight on the Saturday. We wanted to make sure that we didn't miss it, so we stayed at the hotel there the night before. It was a Radisson Blu and was so impressive. We had a lovely room - but the most impressive thing was the bar. it had a three storey high wine tower just crammed with bottles of wine. We sat having dinner looking up at it trying to work out how they got the bottles down. 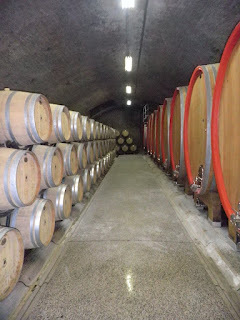 There were wires and pulleys that we could see - but none of the wines seemed to move. It said on the menu that if you wanted a wine then your own wine angel would get it for you. 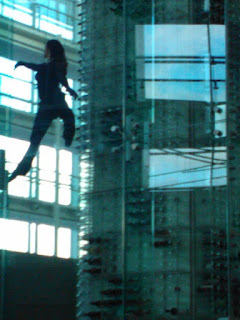 Just then we looked up and there was a woman flying up through the air inside the tower, twirling and doing somersaults and walking up the glass walls like spiderwoman. Then she hung upside down for a while before retrieving a bottle of wine for the people at the table in front of us. The waitress said that only trained gymnasts and dancers are allowed to do it (shame - I would have loved to have a go!). This is the only one in Europe - though they do have one in Singapore and one in Las Vegas. It was pretty spectacular! The next morning we went over to the airport and got our flight with no problems. The pilot was called Toby and was reassuringly posh :-) He got us to Ljubljana in super-quick time - only one hour and forty five minutes. We got a taxi for the thirty minute journey to Lake Bled and the sun was shining. When we got to the hotel the doorman rushed out to get our cases and we went in to check in. 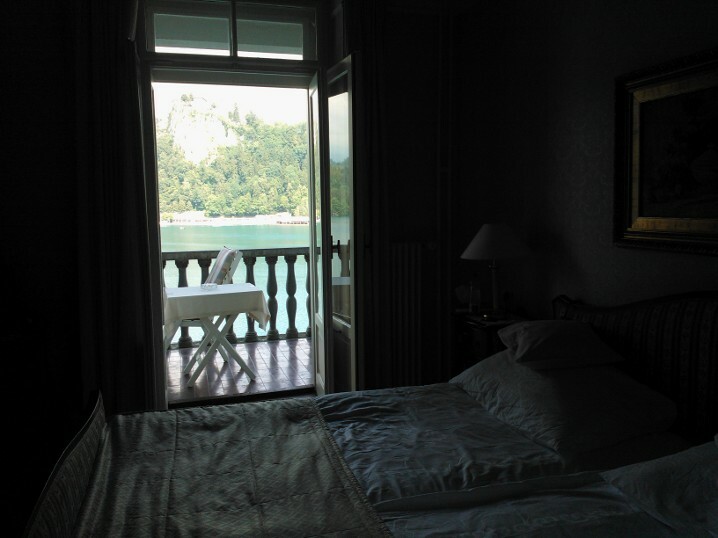 We had a room on the second floor and we had asked for a lake view. It was breath taking. 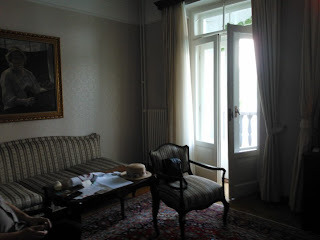 We had two french windows that opened out on a balcony and the views were amazing. Sofa end of the room! ﻿﻿ This was more like a suite than a room! We even had chocolates on the pillow and a letter inviting us to afternoon tea. 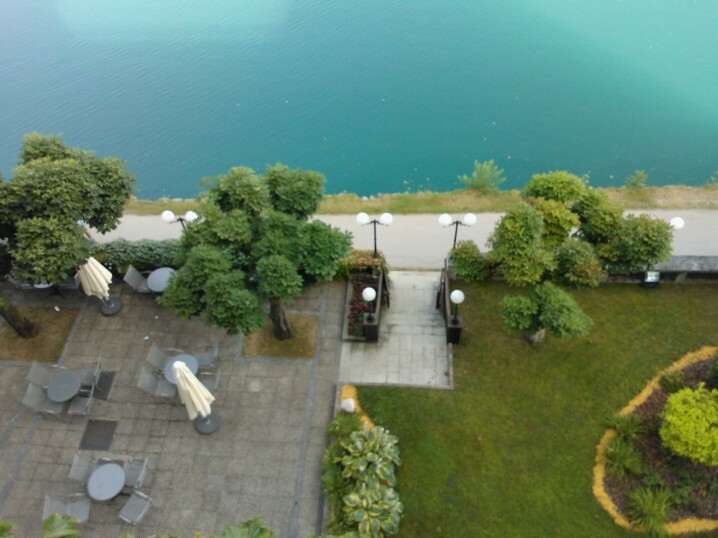 It has it's own private "beach" - a sun bathing area on the edge of the lake as well as a flotilla of rowing boats that we could use for free for an hour each day. Eager to explore we unpacked, then we had a wander down to the Lake edge and into town. It was still really warm right into the late evening, no need for any jackets or long sleeves. We found somewhere to eat, a restaurant called the Aquarium Grill which served Slovenian food as well as more recognisable fare. Nathan decided to try something Slovenian, and opted for a sausage dish with cabbage and apple salad and roast potatoes. I had a bit and it was quite tasty. I went for Weiner Schnitzel, which was delicious. Then for dessert we tried the famous Bled Cream Cake. 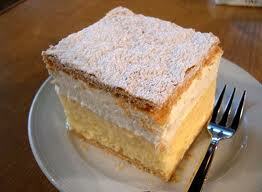 A little like a vanilla slice actually - but taller with custard and cream in it. Very sweet - though pretty filling! We had a wander back to the hotel and sat out on the terrace bar and watched the illuminated castle reflected in the waters of the lake. 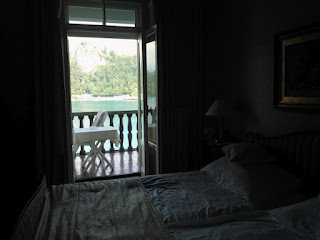 We were the first of the wedding guests to arrive in Bled. The bridegroom and his party had decided to spend a couple of days in Ljubljana, the country's capital, to have a look round. The bride's family were all on their way from the USA. We wanted to have a look all round the lake in the morning so we had a bit of a walk, then we saw the little white Tourist Train, It looks like a train but actually runs on the road. We paid the driver 3.5 euros and hopped on. It was a very hot day - 33 degrees - so it was good to be moving (breeze!) and in the shade. Luckily N had bought me a hat at the airport as we came out - it was certainly needed! We saw the island close-up - where part of the wedding will take place on Wednesday. It is about 6 kilometres all round the lake and takes about an hour and half to walk it. We might try that later in the week. By the time I emerged, the rest of the wedding party were beginning to arrive. N was having a drink on the shady terrace with the groom while the bride and her family were unpacking. Others arrived throughout the afternoon as we sat and had a drink with each as they arrived. The ladies of the party left at intervals to get their nails done as we sat enjoying the view, sunshine and local drinks. I discovered that they had iced tea - so was very happy. We all decided to go out for dinner together that night and found a fish restaurant just across the road that could fit all 15 of us in. N and the groom decided to have shark and chips just "because it sounds dangerous" :-) I went for the salmon which was delicious. I ordered a wine spritzer and it was HUGE. In fact it was a carafe of wine and a bottle of lemonade. I had to share it with the maid of honour - I'm not used to drinking again yet! After the meal some went back to their hotels as they were tired after their long journeys, while some of us went to another bar. It was the night of the Euro 2012 final and some of the male members of the party wanted to try to catch the final. We found an outdoor place with big screens and many seats so we managed to see most of Spain beating Italy. There were fans of both sides there but it was very good natured. After that most of the women went back and the groom, best man and N and I went to another bar called Devil. As we arrived the barmaid was just running after two Japanese men who were trying to walk out with their glasses (still full of beer) There were brought back inside looking sheepish and were suitably chastised. We sat and got a little more tipsy - catching up with the groom and his brother, who are old friends of N's. They hadn't seen each other for a while. so ther was a certain amount of catching-up and putting the world to rights. That done we all retired to our rooms. Just before we parted the groom informed us that we'd have to be up early the next morning as he'd arranged a full day trip for everyone and the mini buses would be waiting for us at the crack of dawn! We had an early start, breakfast at 7am and the coach waiting for us outside at 8am. Breakfast is pretty nice, lots of choice although their cornflakes do not look or taste anything like the ones we know and love! I had "sport muesli" which was crunchy followed by some fresh fruit including water melon, cherries and pineapple. The cherries are grown here and are just in season. They taste delicious! We set off with 15 of us (actually the entire wedding party) in two minibuses along the bumpy and winding roads, down the western side of Slovenia. It wasn't long before we discovered that three of the party suffer from travel sickness.The other minibus pulled over first, when the groom's brother felt ill, then ours had to stop because poor Nathan succumbed too. The female party member managed to hang on until just before lunch. We travelled over the Julian Alps, with it's alpine villages and ski resorts. We took photos of one particularly terrifying ski jump - scene of a recent world record. Apparently Eddie the Eagle ( remember him?) used to train here, he is still very popular here and visited only last week. Then we started to descend through a river valley and the driver pulled over into a lay-by ( no - no-one was sick this time) so that we could climb over the fence,scramble down a steep bank, get over some rocks and then - bliss! Paddle in the cool, cool river. As we did, we saw tiny fish in the clear alpine water. Some of us wondered if they were those fish that give you pedicures, but they seemed scared of human feet. Can't really blame them! It was so nice as the temperature reached 33 degrees. Our rapture was only broken when someone spotted a snake in the river, and not a small one either, so we put our shoes back on and got back on the buses. Luckily they did have air conditioning. Next we descended to the gently rolling hills and green vineyards of Slovenia's wine-making region. We stopped for lunch first, where were served with ice cold water, beer and other beverages while we perused the menu. 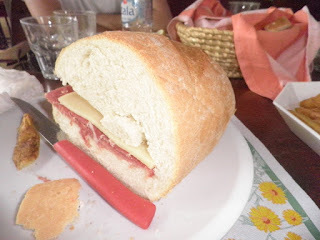 I wasn't too hungry, so went for a sandwich with prosciutto ham and cheese and some gnocchi which came with a ragu sauce or gorgonzola and one or two brave souls opted for the fried squid. 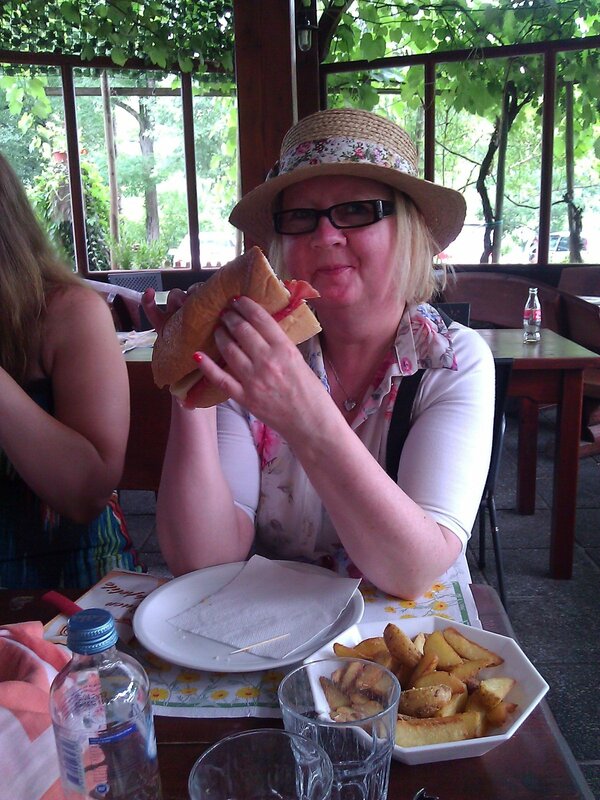 Nathan had a burger, which came encased in breadcrumb with cheese and ham inside, I had a taste and it was delicious. The fries were rustic, handcut and well seasoned with rosemary and sea salt, piping hot and delicious. Then my sandwich came it - and everyone gasped. It was a half loaf of bread on a plate stuffed with ham and cheese. It was bigger than my head! Everyone was laughing and taking photos. I cut a slice off the end and managed to eat that but eighty percent of it still remained. I asked then to wrap the rest up and we took it with us. It made a nice dinner for N and I tonight with some left over for the ducks on the lake in the morning. The bit left over that we took with us! After lunch we all piled back on the bus, where the internal temperature read 43 degrees. The bus driver, a cheerful English chap called Graham, told us that the temperatures are exceptionally high for Slovenia - it is usually just in the twenties. It has been like this for 2 weeks now. We are all hoping that it cools down just a little for the wedding on Wednesday. 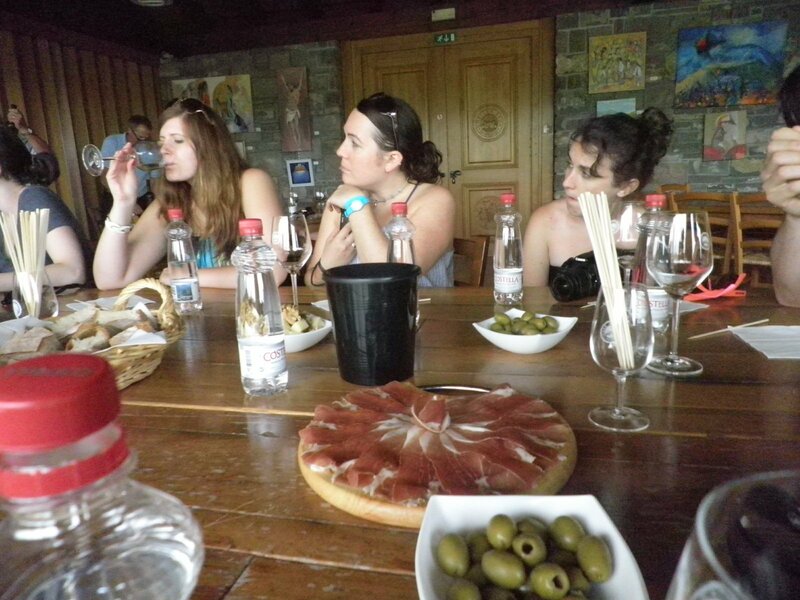 The next stop was the Dobrovo winery, where we were to taste some of their excellent Slovenian wines. The best part of the tour was when we went into the cellars as it w freezing cold. Such bliss! Our tour guide, a dapper deeply tanned white- haired Sloven couldn't speak English so Helena, Graham's Slovenian wife and driver of the other bus translated as he went along. He was certainly passionate about his subject and although he was meant to be retired now he continued to do the tours. He told us about the types of grapes and wines they produce for various markets, especially for the USA and Italy and England. They also grow cherries and apricots here and they are just having the biggest harvest they have ever had. 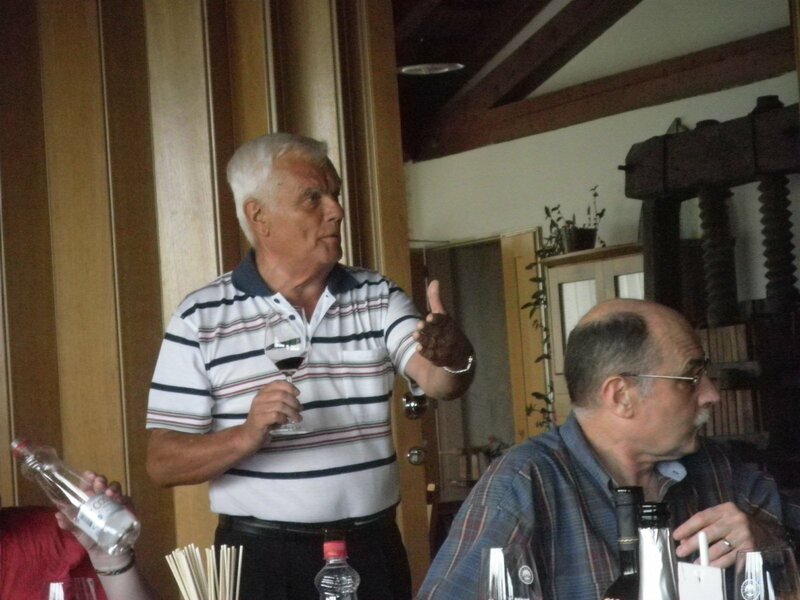 Enthusiastic wine guide - he loves his job! Once he'd taken us round we went into a room set out with wine glasses, bowls of walnuts, cheese and olives for the tasting session. We started with a white sparkling wine, which was tangy, followed by a nice white. The next white was an oak aged one and the taste was so much better then the previous one. Then we had a full bodied Merlot which at 14.5 percent was a little strong for the early afternoon. We finished with a dessert wine, only 10 percent but very sweet. So a little would go a long way. ﻿ So feeling quite mellow we got back on the buses for the three hour trip back to our hotel. The driver took the direct route back via the motorway rather than risk his nice interiors this time! No mishaps on the way back and we arrived back at the hotel tired but happy. No-one felt like going out for dinner. We all just relaxed in our rooms, sorry! Suites! N and I went down to the bar for a nightcap around ten. We sat outside watching lightening over the castle, until a huge spider dropped onto our table and scared me back inside! Europa Coaches Slovenia is an experienced company that provides transportation services in Slovenia and all around Europe. We offer professional bus services as also other transportation vehicles services. Gone Yesterday - Hair today! !